A biodegradable, non-corrosive cleaner and EPA registered disinfectant that removes scale and organic buildup typically found in potable water tanks, lines and automatic coffee maker systems. The active ingredient in Glyco-San® is considered one of the safest antimicrobial agents from both a human health and environmental perspective. 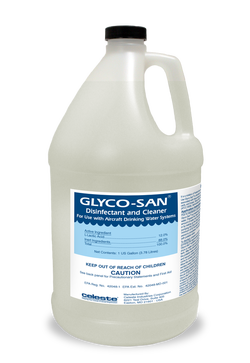 Coupled with Celeste’s proprietary blend of surfactants, Glyco-San® penetrates the multiple layers that form the scale that harbors bio-film, lifting them away from the walls of the system and emulsifying them for a thorough cleaning and disinfection. When used as directed, effective against Staphylococcus aureus, Salmonella enterica and E. coli. Can be disposed into sewer systems in accordance with local regulations.